The number of people crossing the Norwegian-Russian border is shrinking. But some people, like Aleksandr, will continue to travel between the countries. «I have been doing my shopping in Kirkenes since 1995», he says. Economic hardship, the weaker ruble, as well as sanctions and counter-sanctions, is having its toll on east-west trade and traveling. So also in the local borderlands between Norway and Russia. Figures from the Norwegian border police show that the number of border-crossings between the two countries is on its lowest level in several years. In May, a total of 20,902 crossings were registered at Storskog, the Norwegian border checkpoint. That is a year-on-year decrease of 6,7 percent. In the first five months of the year, the decline is 4,5 percent compared with the same period in 2017. The drop in cross-border traveling is quickly felt by local businesses in Kirkenes, the Norwegian border town. Shop owners say they now clearly sense a decline in the number of Russian customers. The trend is felt also in Sparkjøp, a local retail shop. According to shopkeeper Irina, herself a national from Russia, there are now less Russians coming. «The Russian soul likes everything», he says with a smile. She argues that prices on many products in Russia are getting higher and that several key products actually are cheaper to buy in Norway. «And some things have higher quality over here,» she underlines. In weekends, many people travel all the way from Murmansk to the Norwegian border town. On workdays, the Russians in Kirkenes are mostly from the nearby towns of Nikel and Zapolyarny. «As soon as they finish work they come here, many of them every week», says Irina. The drop in current cross-border traveling follows a year of significant growth. In 2017, more than 265 thousand border-crossing were made between the countries, a 12,6 percent increase from the previous year. That triggered hope among many that traveling could return to the record numbers of 2013, when more than 320,000 people crossed the border. Back then, the visiting Russians sparked a boom in local retail business in Kirkenes. New shopping centers were built and more brands came on offer. At the same time, Norwegian authorities liberalized travel regulations, enabling Russians to smoothly cross the border with multi-entry visas. In the local borderlands, people on both sides are even allowed to cross the border without a visa, only with a so-called local border traffic permit. Among the people who enjoy shopping in Kirkenes is Aleksandr from Murmansk. He has been going to Kirkenes regularly ever since 1995. «I come here because of the quality of the goods», he says to the Barents Observer. «The main thing is not the price, but the quality,» he underlines. And traveling is easy, he argues. «It is only 240 km from Murmansk, the roads are smooth and border-crossing easy,» he says. Also Nadezhda enjoys shopping in Kirkenes. «But it has become more expensive here,» she says. She and her husband are having a round-trip from Murmansk. They first went to Finland and then crossed over to Norway and Kirkenes. She buys local products and brings them over to Murmansk. Many friends have asked her to buy stuff. 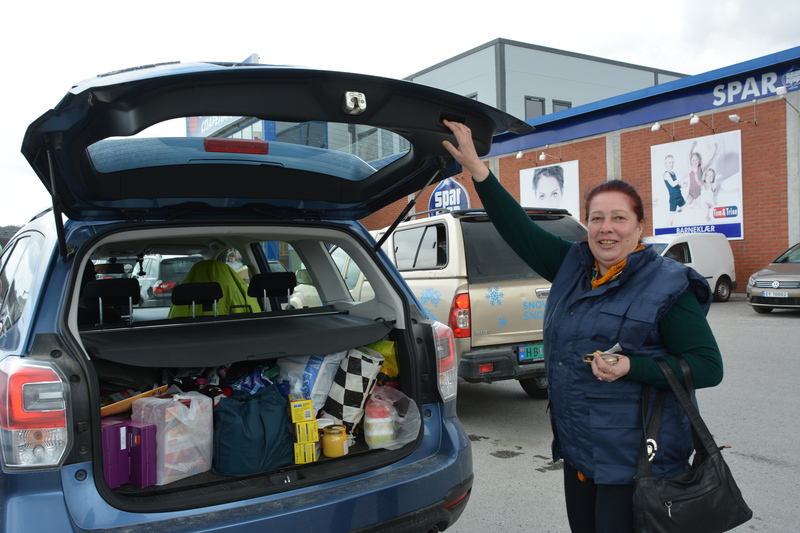 For many Russians, shopping in neighboring Kirkenes has become good business. They are entitled to get the VAT refunded, and can also take use of the Tax Free system. When there in addition is a sale on products, they can do good bargains. Sergey is among the Russians who regularly go to Kirkenes to buy quantities of low-price products for re-selling on the Russian side. You can find Norwegian cheese and other foodstuff in a big number of shops in Murmansk, he says. «But their price is much higher than here,» he makes clear. It is a kind of way to circumvent the sanctions, he admits. Ruble fell sharply - will it influence cross-border shopping?